The Gryphon is a serial killer with a flair for the dramatic - and a grisly trophy case of victims. But when he sets out to add shy, young secretary Wendy Alden (Danielle Harris) to his macabre collection, he gets more than he bargained for. Unfortunately, Wendy's escape from his first assault only deepens the killer's twisted obsession - and affection - for her. Image Entertainment, an RLJ Entertainment (NASDAQ: RLJE) brand, announces the release of the horror-thriller Shiver , starring Danielle Harris (Halloween), John Jarratt (Wolf Creek) and Casper Van Dien (Starship Troopers). Directed by UK based, multi-film festival award-winner Julian Richards, the film is based on the novel by New York Times best selling author Brian Harper (a.k.a. Michael Prescott). 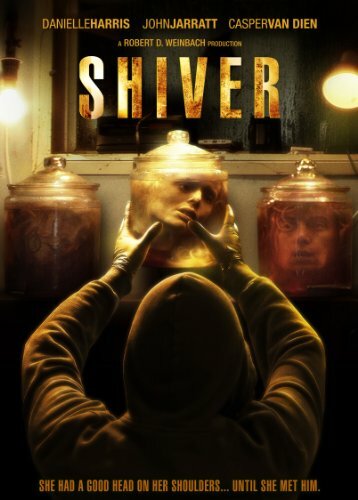 Shiver is available on DVD for an SRP of $27.97 on October 8, 2013. The Gryphon is a serial killer with a flair for the dramatic - and a grisly trophy case of victims. But when he sets out to add shy, young secretary Wendy Alden (Harris) to his macabre collection, he gets more than he bargained for. Unfortunately, Wendy's escape from his first assault only deepens the killer's twisted obsession - and affection - for her. Always one step ahead of pursuing Detective Delgado (van Dien), the brilliant psychopath penetrates police lines at will, circling ever closer to the target of his deranged fantasies. Until, finally, the only thing standing between Wendy and the Gryphon's unthinkable desires is her own desperate, indomitable will to survive. For more information on Shiver , click here.